By December 2012, Oklahoma City, Quail Springs had already given nearly $1 million through the Cooperative Program (CP) for the year. When the church, which forwards 13.5 percent to CP each year, received an historic $21.6 million tithe at year end, the gift propelled the church to unprecedented levels of giving. “Frankly, it is a bit overwhelming,” said Hance Dilbeck, pastor of Quail Springs, of the contribution. “The church members (husband and wife) who gave this did so as a matter of principle,” he said. “They tithed on a large increase just as they have in the past on a smaller scale. Quail Springs followed the same pattern. God has blessed us as we have given 13.5% through the CP. This has been our pattern through multiple building campaigns and a rapidly growing budget. 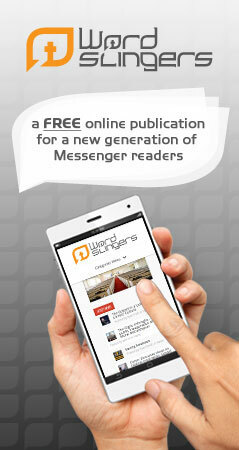 We believe it would be a mistake to change our pattern of giving now,” added Dilbeck. Of the total contribution, Quail Springs sent $2.916 million through the CP, making its annual total more than $3.8 million. 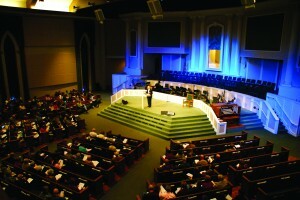 Of the $2.916 million CP contribution, 50 percent was sent to the Southern Baptist Convention (SBC). More than $725,000 will go toward international missions through the International Mission Board, more than $330,000 to missions in North America through the North American Mission Board and approximately $320,000 to be shared by the six SBC Seminaries. In addition, $162,000 from the contribution was sent by Quail Springs to Capital Baptist Association. 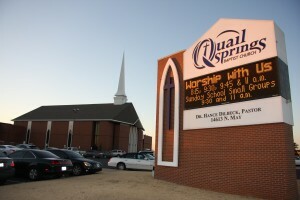 Oklahoma City, Quail Springs offers four Sunday morning worship services, with multiple styles of music. 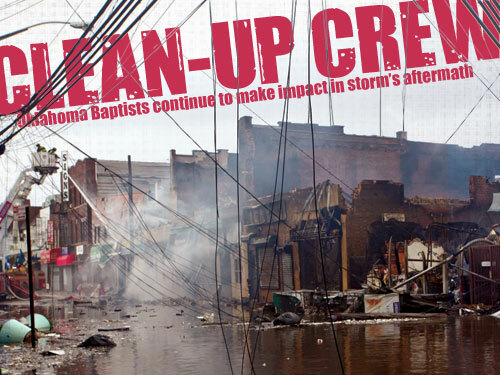 In Oklahoma, funds will be directed by Executive Director-Treasurer Anthony L. Jordan and the Baptist General Convention of Oklahoma (BGCO) board of directors to boost ministries like Falls Creek, partnership missions and the BGCO affiliates. The contribution propels Quail Springs, already a national leader and the state’s leader in total CP giving, to all-time record giver, according to research from the Executive Office of the SBC. The church was founded in 1950 as Oklahoma City, Nichols Hills, and moved to its present location on N. May Ave. in 1982. Quail Springs has had four senior pastors in its history: Rupert Naney, Charles Graves, Brian Waite and Dilbeck. Dilbeck, who holds masters and doctorate degrees from Southwestern Seminary, has been the pastor of Quail Springs since 2003. 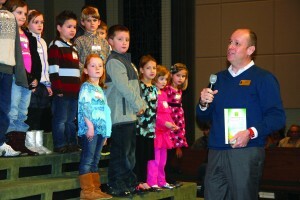 Children’s Pastor, Mark Jones, presents first graders with Bibles as part of the church’s Sunday school ministry. The church’s budget at that time was $1.5 million. Throughout those years, average Sunday School attendance has more than doubled. Prior to his time at Quail Springs, Dilbeck served as senior pastor of Ponca City, First. A native of Pawhuska, he has been the featured preacher for Falls Creek Youth Camp, chairman of the Board of Trustees at Oklahoma Baptist University (2001), and currently serves as a trustee at his alma mater, Southwestern Seminary. At a church business meeting on Jan. 27, Dilbeck announced the momentous gift to the church congregation and called on members to pray about how God would lead them to use the funds.